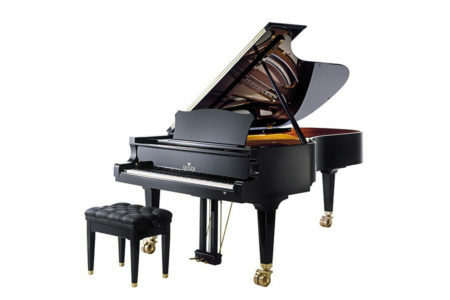 The 7’2″ Hailun HG-218 Semi-Concert Grand attracts the attention of performers and listeners alike. Engineer Stephan Paulello designed its powerful yet delicate tonal range. Extremely responsive to the touch, the HG-218 is ideal for any level of performance. Its lines are elegant by design. The HG-218 beautifies any home surroundings while its sturdy construction makes it the ideal institutional, stage or studio grand piano. Hailun HG-218 keys are made of solid spruce and are individually weighted. The keytops are covered with high grade Japanese PMMA and yield the greatest control to the touch. 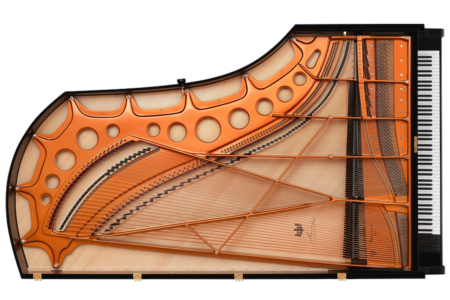 The keys are supported by a solid spruce key frame with maple key pin inserts. Hailun proprietary PerformancePlus™ design action includes parts made of European Hornbeam, reinforced German felt hammers, and an aluminum with maple core action rail. The result is an astonishing predictable control resulting in a wide and colorful range of tones. 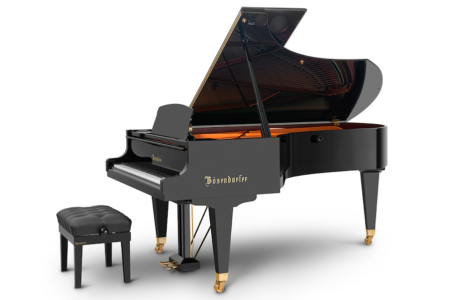 Enjoy the rich harmonics and the fuller sound the piano provides because of the well-designed and excellently crafted duplex scaling of the HG-218. The HG-218 is equipped with a fully functioning sustenuto pedal to provide the maximal expression available. The soundboard provides the optimal design of the best quality Bavarian spruce. Thirteen dovetailed ribs evenly distribute the energy. The results are … the finest dynamic range, a wonderful even tone that carries across its whole gamut of frequencies and a powerful expressive sound emerging from the large soundboard. 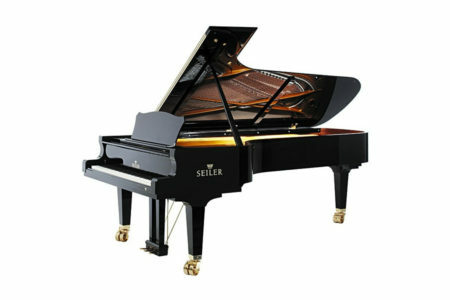 The high quality support beams insure stability and durability to this fine instrument. The sound of HG-218 is futher energized by a solid constructions of its inner and outer rims. The multiple layers of alternating hard maple and walnut are reinforced with strategically placed dowells enhancing the piano’s longevity. The graceful plate designed by Stephan Paulllelo makes HG-218 stand out. The Hailun WetSand™ process insures many decades of tuning and structural stability. The HG-218 bridges are made from select hard maple for durability and precision. Paullelo’s unique design contributes to the clearest, most powerful sound bass produced by a piano of its size and category. The HG-218 pinblock is made from the finest maple, cross-laminated to assure the instrument holds its tuning and voicing through decades of playing the piano. The HG-218 strings are imported from the acclaimed Röslau Piano String Factory originating in the district of Wunsiedel in Bavaria, Germany. Known for its uniform thickness and roundness and its higher tensile strength, they are among the finest music wires available. The bass strings are made of solid copper windings.